Times Higher Education (THE) revealed the 2019 World University Rankings. 1258 universities were evaluated this year, and Sabancı University was within the 351-400 bracket. While Sabancı was the highest-rated Turkish university in the rankings, 22 other Turkish universities were included. Times Higher Education (THE) revealed the 2019 World University Rankings. 23 Turkish universities entered the rankings this year. 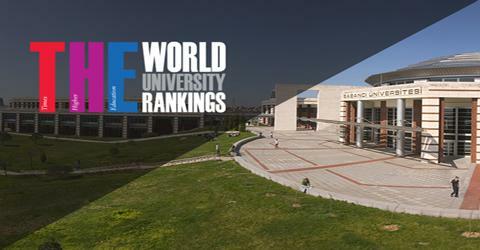 Sabancı University was ranked in the 351-400 bracket among 1258 universities from 77 countries, and was the highest-ranked among the 23 Turkish universities in the list. The 23 Turkish universities and their respective brackets are: Sabancı University 351-400; Koç University 401 – 500; Bilkent, Boğaziçi and Hacettepe Universities 501 – 600; ITU and METU 601 – 800; Anadolu, Atılım, Erciyes, Gebze Technical and Istanbul Universities 801-1000; Akdeniz, Ankara, Bahçeşehir, Çukurova, Dokuz Eylül, Gazi, İYTE, Marmara, Ondokuz Mayıs, TOBB and Yeditepe Universities 1001+. The methodology of THE University Rankings assesses successful universities based on 13 performance indicators in teaching, research, citations, industry income and international outlook.